As the country prepares to celebrate our nation’s birthday, the two of us began talking about some of our favorite places that we have spent the 4th of July holiday. There are so many great places to visit around the country, each with their own style and personality. But there are special places that stick in our memory as being some of the greatest 4th of July experiences for both of us growing up. Going to any one of these 5 places for the 4th of July as adults would bring back so many awesome memories. So if you don’t already have plans for the upcoming holiday, here are some ideas for how you can spend your 4th of July holiday! Coeur d’Alene, Idaho is a place full of natural beauty. Nestled among beautiful mountains and a crystal clear lake, the town is extremely tourist friendly with many activities year-round, including the 4th of July. From street parades, boat parades, rentals, beaches, parasailing, golfing, rollercoasters (nearby), you will never be bored when visiting Coeur d’Alene. But for the 4th of July holiday, the prime activity is to await the fireworks over the lake. The city beach near the Coeur d’Alene resort offers great views, as well as a park with music and food vendors. If you are lucky enough to have a boat (or rent one), you can spend the evening relaxing out on the water while waiting for the show to start. Great views can also be found on a number of lake homes near town, or those perched up on the mountains above town. Another beautiful view is from the Coeur d’Alene resort and marina. Book one of their lake view rooms and enjoy the show from your balcony! This is one of my favorite places to spend the 4th of July growing up. For more information, visit the Coeur d’Alene tourism website. One of the most memorable places I spent the 4th of July was in San Francisco. As a kid, I remember that we were visiting for a week to explore the town, as well as visit some of the amusement parks nearby (we were big rollercoaster fans growing up)! But the coolest was being able to watch the fireworks out on the Bay from Fisherman’s Wharf right in the middle of San Francisco! Of course, the town was packed; but we lucked out. As we were wondering around some of the shops in the area of the Wharf, we noticed a parking garage and some people standing on the top floor. It was still light out, but we decided to head up there and check out the view. Sure enough, we were perched just high enough that we could look over all the Wharf buildings – with a direct view out in the bay in the direction of the firework barges. It was a perfect view! There were very few people up on that garage roof, so we decided to camp out until the show. And we will never forget that show. 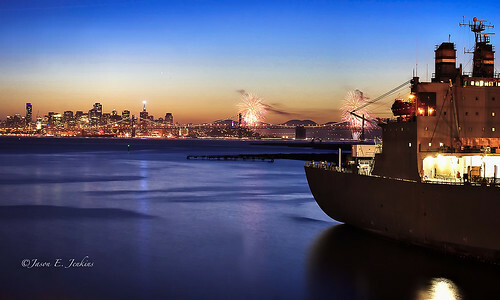 There were actually multiple barges out in the bay shooting off a synchronized show — and we felt like we had the best view of everyone, and to this day, our whole family talks about how that was the best view of any 4th of July show we have seen. Many years have I (Josh) spent the 4th of July watching my team, the Atlanta Braves, play baseball. The Braves aren’t in town over the holiday every year, due to the crazy Major League Baseball schedule. Many teams rotate holiday games, but when the Braves are in town over the 4th of July holiday, it is a spectacular event. Of course, the tailgating is a big part of the enjoyment of every baseball game; however, over the 4th of July holiday it seems everyone is out for the whole day enjoying food, fun, and games in the parking lot. Celebrating our country’s Independence Day in a ballpark watching our nation’s favorite pastime is a sight to see. We love going to the game and sitting in our favorite seats at Turner Field, overlooking the beautiful Atlanta skyline and enjoying baseball. In addition to special presentations and ceremonies that honor our country and its heroes, they put on a pretty great fireworks show after the game. And not only do our favorite seats look out over the city, but they are a perfect spot to watch the fireworks. This is an awesome way to cap off a fun field day at the ballpark. For details about special events and tickets, visit the Atlanta Braves 4th of July event website. When you think of holidays in the summer, like 4th of July, you think of being out on the lake soaking up the sun rays. This is especially true outside of Knoxville, Tennessee on a beautiful and pristine lake called Norris Lake. This 33,000 plus acre lake is one of the clearest, cleanest, and pristine lakes in the south. 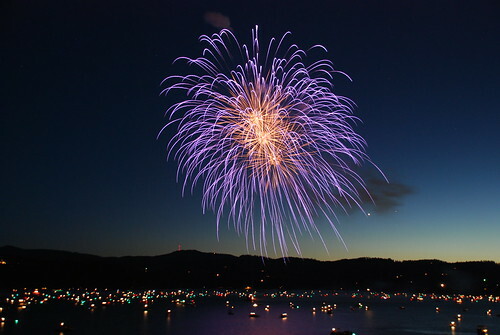 Every year for the 4th of July, thousands of people travel near and far to experience Norris Lake’s celebration of “Fire on the Water”. After a full day of experiencing the lake, thousands of boats join together at a centralized marina to get ready for a fireworks show like no other. As it the sun starts to set, the boats tie together in one unity to celebrate our nation’s independence. The radios are synchronized to a local radios station, and before the sun fully goes to bed, the hour long fireworks show starts in unison to patriotic songs. It is an unforgettable way to enjoy the 4th of July holiday! For more information, visit the Sequoyah Marina website at Norris Lake. As you would imagine, Walt Disney World has a pretty awesome 4th of July fireworks show…but be prepared for major crowds! It’s worth it, but be prepared. In fact, the 4th of July holiday at Walt Disney World is easily one of the busiest days of the year (besides Christmas, New Years, and Thanksgiving). So just accept the fact that you won’t be riding many rides, and go with the flow. The ambiance is wonderful, and the show is unbelievable. Typically, they will shoot a synchronized show from behind Cinderella’s castle and from the island in the Seven Seas Lagoon (out in front of the Magic Kingdom Park). This provides a great view to the hotels around the Lagoon as well, such as the Grand Floridian Resort, the Contemporary Resort, and the Polynesian Resort. Also on major events such as the 4th, they have what they all “perimeter” fireworks – which are basically fireworks that surround the Magic Kingdom Park (seriously)! Periodically during the show, fireworks will go off all around you. Imagine standing inside the Magic Kingdom and being able to see sychronized fireworks exploding literally all around you – it’s amazing! If you can, we recommend staying at the Disney resorts that surround the Seven Seas Lagoon. You will have amazing views, with far less crowds that inside the theme park. However if you are not staying at those resorts, you may be lucky enough to score a reservation at one of the restaurants so that you can watch the fireworks during or after dinner. In addition, Disney World will usually run the 4th of July fireworks show multiple nights of the week during the holiday – not just on the 4th. So you will have more than one opportunity to see the show! Lastly, other parks will have great fireworks and holiday shows, like Epcot. For more information on 4th of July festivities at Disney World, visit their website. So wherever you are this year, we hope that you enjoy your 4th of July holiday. Celebrating our nation’s independence with family, friends, food, and fireworks is a truly wonderful experience no matter where you are. But if you don’t have any plans, check out some of these places…or perhaps you want to start planning your 4th of July experience for next year. You won’t be disappointed with any of these recommendations. I love Turner Field and had the priviledge to see an Atlanta Braves vs. Philadelphia Phillies game years ago. Sadly, I won’t be able to experience Independence Day at Turner Field as 2016 is the final season for this stadium. Hopefully, they will continue the tradition when the move into the new stadium next year. Thanks for checking out the post. Celebrating Independence Day at Turner Field was something we will never forget. It is sad that we will not be there this year to experience one more game in Turner Field, but I am sure the new stadium will carry on the tradition.